I paid 50 cents for this fragile old piece of paper mocking a woman for the way she dresses. 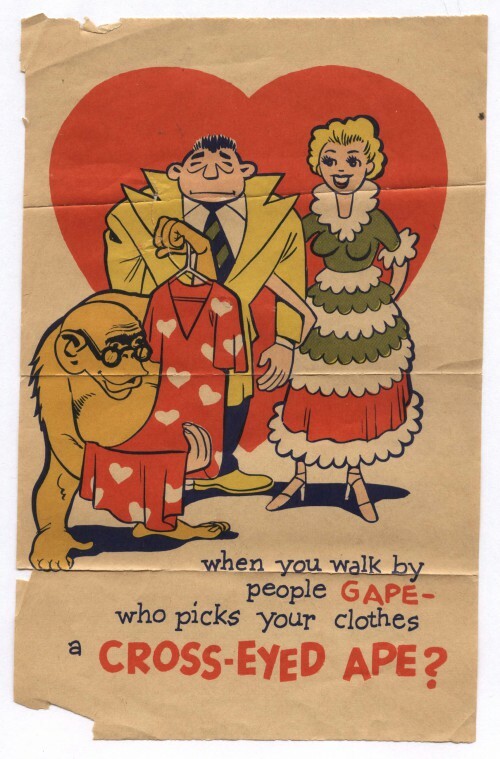 (At first glance, I was certain it was mocking the man; but the ape proffers a red dress with white hearts.) I’m not sure why I had to have it; but I did. Was it a page in a book? While there’s no printing on the reverse, it’s possible; sometimes illustrations (especially those with color) had single pages to themselves (these are called “plates”). If it comes from a book, what was the book about? Just a silly joke book? Or was it a silly page illustrating one point in the text? Were there more pages like this? Did the original owner find the page loose and save it? Or did they tear it out themselves? Or maybe it’s not from a book at all. Only the right edge of the paper seems to be without nibbles, cuts and other imperfections — suggesting this is not the original size. Maybe it was an advertising or promotional piece… Some sort of flyer, an advertising circular, whose product &/or company name have been cut away by an original owner who liked the joke &/or illustration. Then again, there’s all those hearts… Was this some sort of Valentine’s Day themed thing? Since there is nothing else on the paper to identify it, no artist credit, date or other copyright or publishing credit, I may never know what this paper was originally intended to do or where it comes from. But, like the heavy crease lines from folding which have begun to tear, it doesn’t decrease the value to me. Not just the 50 cents I paid or even the thrill of research to figure it all out (I am geeky like that), but the fun of looking at it. The joke still works, after all these years.